Throughout February, Delta is highlighting employees who have made their mark as African-American pioneers in a series called "Delta's Very Own Heroes." This week’s spotlight is on New York-based Delta pilot, First Officer Kyle Greene. Kyle Greene knew what he wanted “to be” before most people even know how to read – in fact, he took his first flying lesson before many people learn to drive. Becoming a pilot was never a question for him, but the path to get there wouldn’t be easy. 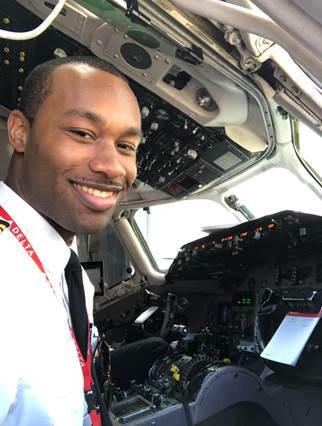 In a recent interview with Delta News Network, Greene, who became a Delta pilot earlier this year, reflects on the 10-year process it took to become at a first officer at the airline he always dreamed of working for, and on the people who helped make that dream possible. DNN: What first spurred your interest in aviation? Can you talk about your career path to becoming a pilot? First Officer Kyle Greene: I’ve known I wanted to be a pilot since I was 4 years old – my mom took me to the Blue Angels Airshow in New Orleans, and from then on, I was hooked and I didn’t really need any other motivation to go after my dreams. Growing up in Atlanta, my mom would always take me to watch Delta planes land at the airport. Later, my experience with Delta and the Organization of Black Aerospace Professionals would confirm it for me – Delta was the airline I wanted to fly for. Fast forward to when I was 15 and one of my mentors Capt. Walter Shah bought me my first flight lesson. That led me to attend Aviation Career Education Academy [a program that teaches students about all things aviation] in 2007. The following year, I was lucky enough to be selected for Delta/OBAP’s Flight Line camp, where Delta paid for 15 hours of flight training for me, and I got to fly my first aircraft by myself. That summer I continued my flight training at Middle Georgia College. I got my pilot’s license that fall and became a flight instructor at the school while I finished college. After I graduated, I flew for the Georgia Forestry Commission’s Fire Patrol unit. I’d take a small Cessna-182 up across two districts in Georgia, looking for wildfires and notifying the fire department, and then I moved to Kansas City to help with a terrain mapping project. Once I got my hours, I flew for a couple of commuter airlines, including ExpressJet. I started at Delta earlier this year, based in New York on the MD-88/90, but I relocate back to Atlanta next month. I’m so excited I reached my dream airline, and I’m looking forward to a long career here. DNN: Becoming a pilot takes years of training and a lot of dedication. Who inspired you to follow your dreams of flying? KG: My mom. She’s a pretty strong woman and an entrepreneur. She instilled in me the work ethic and values that got me to where I am today. That being said, the journey to becoming a pilot can be a big hurdle. When I was growing up, I didn’t have anyone in my family that went through the [pilot] track, but all the people I’ve met through ACE helped me a lot. 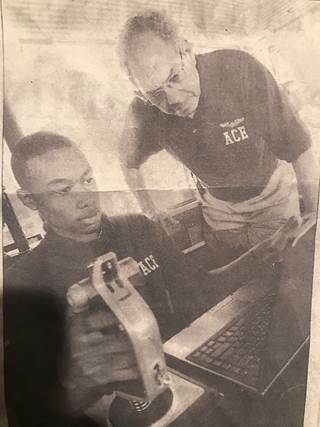 ACE Academy founders Julius Alexander and Capt. John Bailey, a retired Delta pilot, are two others who greatly influenced me in my pursuit of becoming a pilot. DNN: You went to flight camp when you were a kid, and now you’re co-director of the Delta/OBAP sponsored aviation summer camp, Aviation Career Enrichment. What were your favorite parts of flight camp when you were young, and how do you use that experience to inspire those attending the camp now? KG: Being around aviation professionals, like Mr. Alexander and Capt. Bailey, was one of the best parts about the camp because they could answer all of my many questions about the industry. Other things I enjoyed about camp were the opportunity to fly the full-motion simulators and the Delta Dream Flight [a daylong flight co-sponsored by Delta and OBAP]. A lot of these kids have never been on an airplane, so it’s the highlight of the whole week to have Delta take a [Boeing] 757 out of service and let us use it all day to take 150 kids to fly somewhere to learn more about aviation. I try to use all my experience to give the kids guidance because the path [to becoming a pilot] can be difficult if you don’t have someone to help you navigate it. The kids can see that someone who was once in their shoes is now an airline pilot – I can’t think of anything more rewarding than that.